This is the first anthology of nature writing that celebrates California, the most geographically diverse state in the union. Readers—be they naturalists or armchair explorers—will find themselves transported to California's many wild places in the company of forty noted writers whose works span more than a century. Divided into sections on California's mountains, hills and valleys, deserts, coast, and elements (earth, wind, and fire), the book contains essays, diary entries, and excerpts from larger works, including fiction. As a prelude to the collection, editor Steven Gilbar presents two California Indian creation myths, one a Cahto narrative and the other an A-juma-wi story as told by Darryl Babe Wilson. Familiar names appear in these pages—John Muir, Robert Louis Stevenson, John McPhee, M.F.K. Fisher, Gretel Ehrlich—but less familiar writers such as Daniel Duane, Margaret Millar, and John McKinney are also included. Among the gems in this treasure trove are Jack Kerouac on climbing Mt. Matterhorn, Barry Lopez on snow geese migration at Tule Lake, Edward Abbey on Death Valley, Henry Miller on Big Sur, and Joan Didion on the Santa Ana winds. Gary Snyder's inspiring Afterword reflects the spirit of environmentalism that runs throughout the book. 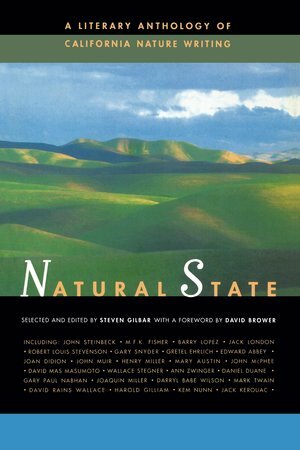 Natural State also reveals the many changes to California's landscape that have occurred in geological time and in human terms. More than a book of "nature writing," this book is superb writing about nature. Steven Gilbar lives in Santa Barbara and does not get to spend as much time in the wilderness as he would like. His previous anthologies include Tales of Santa Barbara (1994) and Red Tiles, Blue Skies (1996).